Wisdom teeth, 8’s or third molars as they are commonly called, probably cause more trouble to young adults than any other dental problem. Why is it that so many people in their late teens and early twenties are told that they have impacted wisdom teeth and need to have them removed? The reasons are different but the end result is often the same; “you need to get your 8’s out”. While it is possible that there is an evolutionary trend for some people not to have third molars, for most of us who have them, there are many reasons why they must come out. It can be as simple as because they are the last teeth to erupt, there is not enough space to accommodate them in the mouth. It is mostly the lower ones that give the most trouble but upper ones can also end up in strange places. 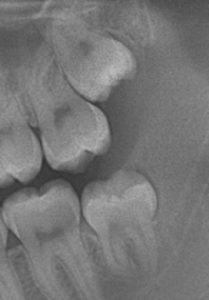 What should be done to deal with wisdom teeth that are causing problems? Well there are options, the first of which is to ignore them and do nothing. Unfortunately, the problem will usually persist and eventually, you will agree to having them removed. After evaluating an OPG radiograph of the mouth I will sometimes offer the choice of taking them out myself under local anaesthetic or referring you to an Oro-Maxillo-Facial Surgeon for removal, mostly in hospital under general anaesthetic. If I believe that the removal of the 8’s could be complicated or there are potential risks involved such as damage to the nerve or adjacent teeth, I will always recommend an Oral surgeon remove the teeth. They are very skilled at removing impacted wisdom teeth and if there is a risk of nerve damage they will use 3-D radiography to guide them to reduce the risk of complications. At the end of the day, there is always an element of risk which needs to be explained and assessed as to the possible effects if there is damage to the lingual or inferior dental nerve. Obviously, if you are a professional singer or play the flute or some other reed instrument in an orchestra, any loss of nerve sensation would be catastrophic. Such a person may choose to live with the problematic teeth. Fortunately for most people, wisdom teeth removal is a minor inconvenience. Simple aftercare instructions and over the counter analgesics and anti-inflammatories assure a quick recovery. The above is general information only and I assess each case on its merits. If you have problems or concerns we are here to help and advise you of your options after a proper consultation.